Nothing says fall like the scent of gingerbread and cinnamon spiced apples drifting through the house. There is also no better way to get everyone up and out of bed on a chilly weekend morning than with a breakfast filled with those yummy flavors—and scents! I have said before that I love gingerbread—and my gingerbread cookies and gingerbread waffles are always big hits on the home front. This morning, I wanted gingerbread and also needed to use up a few apples—it was time for Gingerbread Pancakes with Roasted Cinnamon Apples. Roast the cinnamon apples. Preheat oven to 425. Spray a 9 inch, square baking dish with cooking spray. Arrange the apple pieces in the pan, spreading them out as much as possible. In a small saucepan, add the juice, water, the brown sugar and the butter. Stir over medium heat until butter and sugar are melted and the mixture is fully combined. Add the cinnamon to the saucepan and whisk to combine. Pour the liquid over the apples. Bake in preheated oven for 25-30 minutes or until apples are tender, basting every 10 minutes with spiced sauce from the pan. Prepare and preheat the griddle or skillet. While the apples are roasting, preheat a medium sized skillet or griddle and lightly grease with cooking oil if worried about it sticking. Prepare the gingerbread pancake batter. In a large mixing bowl, combine the flour, baking powder, salt, and spices. Thoroughly mix to incorporate the spices completely. In a medium mixing bowl, combine the eggs, milk, and molasses. All at once, stir the wet ingredients into the dry ingredients until well blended. Cook the pancakes. Pour desired amount of batter onto griddle or skillet. Fry until golden brown on each side. Remove the pancakes from the griddle and keep warm. Serve the gingerbread pancakes with cinnamon apples. 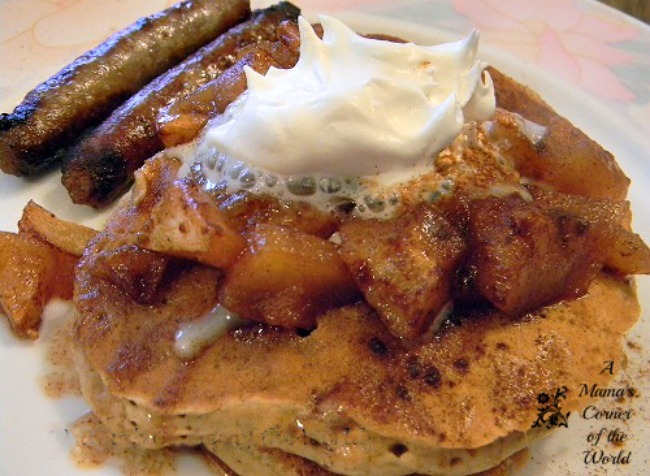 Drizzle apples and spiced sauce over each individual stack of gingerbread pancakes. 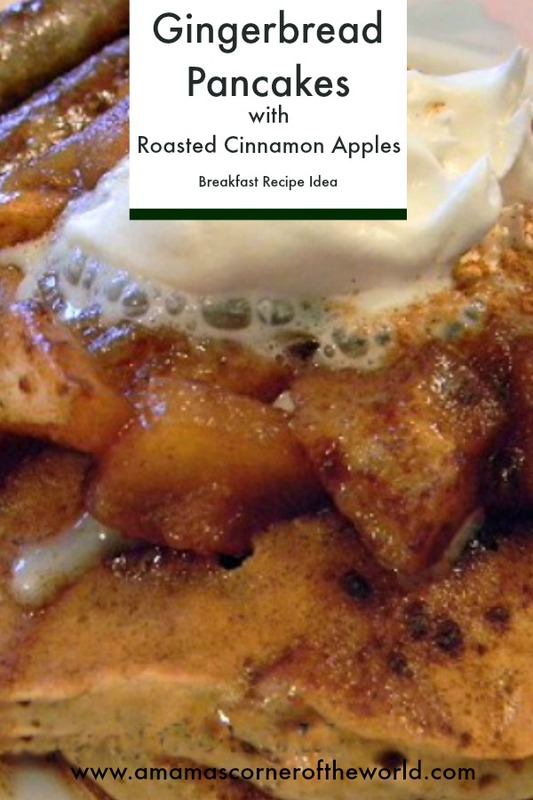 Top with whipped cream and additional cinnamon, if desired. Nothing says fall like the scent of gingerbread and cinnamon spiced apples drifting through the house. There is also no better way to get everyone up and out of bed on a chilly weekend morning than with a breakfast filled with those yummy flavors—and scents! Ummmm, YUM! These sound delicious! Definitely giving them a try!